You have noted following subsequent events in the audit of a client. State with reasons whether such events should be adjusted or disclosed. The year end of the company is December 31, 20×1. The accounts were approved by the directors on March 5, 20×2. 1. Rs.300,000 were receivable from a customer at December 31 20×01. Due to weak financial position, specific provision of 25% was made against this customer in the draft accounts. In February 20×2, before the accounts were authorized for issue the customer was declared. Insolvent and nothing was recoverable. 2. 500 units of an inventory item were valued at unit cost of Rs.2,000 at December 31, 20×01. In January 20×02, the product was sold at Rs. 1,600 per unit. Item # 9 through 16 are all non adjusting events because they do not relate to conditions existed at balance sheet date. ISA 560, Subsequent events requires that the auditor should apply procedures to specific transactions occurring after period end to obtain .audit evidence as to account balances as at period end. Give some examples of such procedures.? – Sates invoices dated subsequent to year end should not be recorded before the year end . – Verification of bank reconciliation and bank statements of subsequent period .. Unusual delay in clearing the cheques issued before year end indicates that the cheques were actually sent after year end arid entered in the period before year end to improve current ratio. – Search for unrecorded accruals by verifying cash book of subsequent period. What procedures are adapted by an auditor to identify subsequent events up to the date of auditor’s report? 1. Obtain understanding of the procedures management has established to ensure that subsequent events have been identified. (a) Current status of items that were accounted for on the basis of estimated facts. (b) Issuance of new shares or debentures. (c) Sales or acquisition of assets. 3 . Reading minutes of the meetings. 5. Obtain written representation from management. State auditor’s duties for facts which become known to the auditor after the date of auditor’s report but before financial statements are issues? Masoom & Co. Chartered Accountants have audited the financial statements of Cunning Limited. The financial statements have been issued after getting proper approval of the Board of Directors and audit report signed by the auditors. After some time, the auditors came ‘to know that a major law suit was decided against the company subsequent to year-end but before the audit report was signed by the auditors. The issue existed at the balance sheet date. The outcome of the law suit was not brought to the knowledge of the auditors. Had it been known to the auditors. The financial statements would have required proper adjustments in this respect. State auditor’s responsibilities in this situation. a) Request management to amend the financial statements and inform the shareholders of the situation. b) Issue new audit report with an emphasis of matter paragraph which should refer to previous report. c) Carry out subsequent events review up to the date of new auditor’s report. If the management does not amend the financial statements there auditor should take appropriate action to prevent reliance on the audited accounts previously issued including obtaining legal advice. Management may not be required to issue amended financial statements hen issuance of financial .statements of next period is imminent if appropriate disclosures are made in next year’s financial statements. The management of Zafar Textile Limited (ZTL) has become aware of an error in its audited financial statements after its issuance to the shareholders. ZTL intends to rectify the error and have approached the auditor for issuance of a new audit report on the revised financial statements. Describe the procedures which the auditor should adopt in the above circumstances. 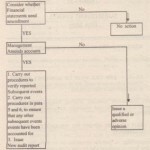 (a) Carry out the audit procedures necessary in the circumstances. b) The audit procedures should be designed to obtain sufficient appropriate audit evidence that all events up to the date of the auditor’s report that may require adjustment of, or disclosure in, the financial statements have been identified. (c) Review the steps taken by management to ensure that anyone in receipt of the previously issued financial statements together with the auditors’ report thereon is informed of the situation. 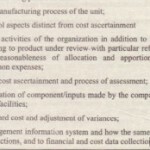 (d) Issue a new report on the revised financial statements. The new auditors report should include an emphasis of a matter paragraph referring to a note to the financial statements that more extensively. discusses the’ reason for the revision of the previously issued financial statements and to the earlier report issued by the auditor. approval of the re.vised financial statements . f) If the auditor is unable to obtain sufficient, appropriate audit evidence or if he is not satisfied with the steps taken by the management, he shall seek a legal opinion. It was observed that a particular note of the financial statements was missed out in the published armual report. The auditor’s signed copy available in the audit working papers file contained the note, while the published financial statements did not. The amount involved in the note was not material. What is auditor’s responsibility in such cases? There is nothing in the accounting and auditing standards and in the Companies Ordinance, 1984 which deals particularly with the above mentioned issue. ISA 560 on Subsequent Events is also silent on this issue. The auditors should communicate forthwith with the client and inform them about the omission. Further the auditors should also advise, their clients to inform the Securities and Exchange Commission of Pakistan and the relevant stock exchange. If due to time constraint or any other reason it is not possible for the management to send corrigendum to the shareholders, the auditors should see that the management or board of the directors inform the shareholder about the omission at the AGM at least. Further according to the explanation of section 255, auditors are entitled to attend Annual General Meeting and may inform the shareholders themselves if management fails to do so. Fieldwork for the annual audit of Peach Textile Mills Limited (PTML) has been completed and the financial statements and the audit report are due to be signed next week. During the concluding meeting with the client, the auditor was informed that a fire has destroyed all the raw cloth placed in the warehouse at the mill. About 60% of the destroyed cloth was purchased after the reporting date. However, due to certain defect in the insurance policy, the insurance company settled the claim by paying 80% of the amount of loss. Explain the auditor’s responsibility and the audit procedures and actions that should be carried out by the auditor in the above situation. The auditor is responsible to consider the impact on the financial statements, of all events that take place before the signing of the audit report. (a) Assess the financial impact of the damage as may have been determined by the management by reviewing the accounting documents, board minutes, surveyor’s report etc. (b) If the event needs to be disclosed in the financial statements, because of its materiality, advise the management to make appropriate disclosure. (c) If appropriate disclosure is not made or the disclosure is inappropriate, consider modification of the audit report.